Many of you have left comments for me about how crafty I am & very nice compliments about my abilities & the things I create. I appreciate how that makes me feel. I do enjoy when I can find the time to see a project through that has been bouncing around in my head for a while. I do feel like the Lord has blessed me with talents, but I feel also that these talents have in no way been perfected. I have so much to work on. There are so many people that are better crafters than I. I feel mediocre. One thing I have learned recently is to let go of the fear to create. Many, many, many times I have wanted to make something & would get all my supplies out just to sit & stare at them. I would want to make something cool & would be so afraid that it wouldn't turn out like I had pictured it in my mind that I'd just give up there before really even getting started. Most times, the end result is not what I originally had in mind. This I have learned to be okay with. Usually I love the finished project just the same, if not more. The area that this most applies to is scrapbooking. I have a real desire for my pages to look a certain way & they never do. I'm still trying to find myself & my scrapbooking style, but I have loved what has come along the way. My pages lately have made me pretty happy. I love sharing my stuff with you guys. Thanks for the encouraging words. I wish I had more time to play with crafty things....some day. For now I try to get just enough to make me feel happy & balanced. And....I have chosen to go with a real soft, feminine look for the baby blanket. Here's a look at the fabrics that I picked out today. I really was thinking in my mind "grandma's tea set" for the fabric choices. Lots of girly florals here, which really has not been my style in the past, but I think will look really sweet for this quilt. I'm really excited about this one. ****ETA: Maybe I'll lose that blue fabric. The print is quite large in scale to the rest of them. I love those fabrics! That is going to look so cute! 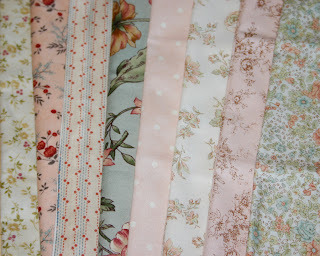 These fabrics are so soft....your quilt will look sweet! Can't wait to see the progress. I love the fabrics and I know it will turn out great. And I love your comments about creating and the fear we sometimes have. I think the thing that helps me most is that no one (NO ONE) can see our mental picture of how we envisioned the project -- whatever it is! Learning to be happy with a result different from the vision and the experience gained in the process is where we find that sense of accomplishment. You're an example to me. Love ya. so pretty, so delicate, just like this little one will be. i am excited for you. yeah i'd loose the blue. its so hard to put fabric like that together, you guys are really cool. did it take you forever to find them? don't lose the blue one! it will look so pretty all together, the scales will just give it more contrast! it is going to be gorgeous :) oh i sound so bossy, it will look beautiful without the blue one too!